When I debuted one of my "work outfits" last week, you said you would be interested in seeing more. Well, your wish is my command. As a graduate student, jeans & a T-shirt is the standard wardrobe. But I think that with a few special touches, grubby jeans & a tee can be transformed into something actually cute. Maybe this will become a regular "grad school chic" series! Instead of a baggy tee, substitute a fitted, soft-as-butter vintage tee. Swap out boring jeans, for a fun colored variety. Add some personality with patterned flats. Layer a basic tee with an easy to move in vest to add interesting details (perfect for under the lab coat too). What tweaks do you make to your everyday basics? P.S. enter to win a J.Crew gift card from me over on Jessica Who? I saw a tote just like your's in Madewell the other week. I love how you have made your outfit look casual yet chic! P.s. I love the demin vest & a happy Monday! This is such a great casual look! I am obsessed with your flats. The pants are an amazing color! Love the casual but pretty look! This is gorgeous! I love the shoes! Jessica Who sent me over to your site! I love this look, Jessica. It's so casual and cute–definitely something I could see myself wearing! You look adorable! Love the color of your jeans and those fun flats! This is such a cute outfit. I love the casual but put together look. Cute casual outfit! 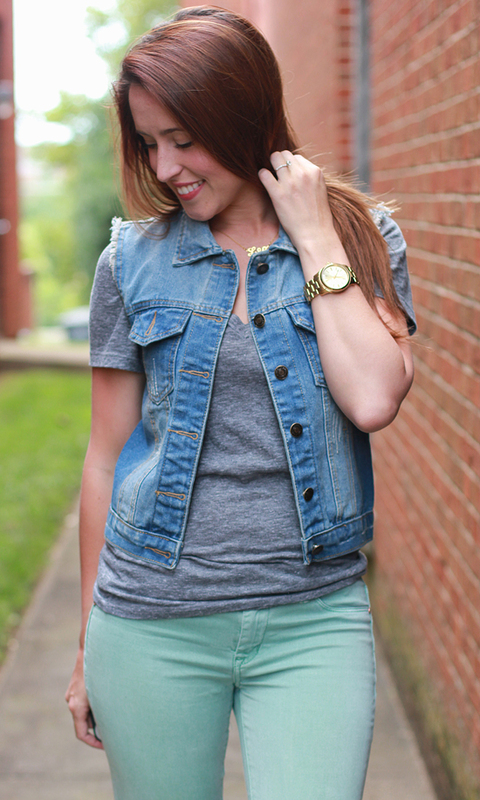 Love the denim vest and tee together! Love this outfit!! The colors and pop of leopard is fab! I love seeing more of your "work wear"! 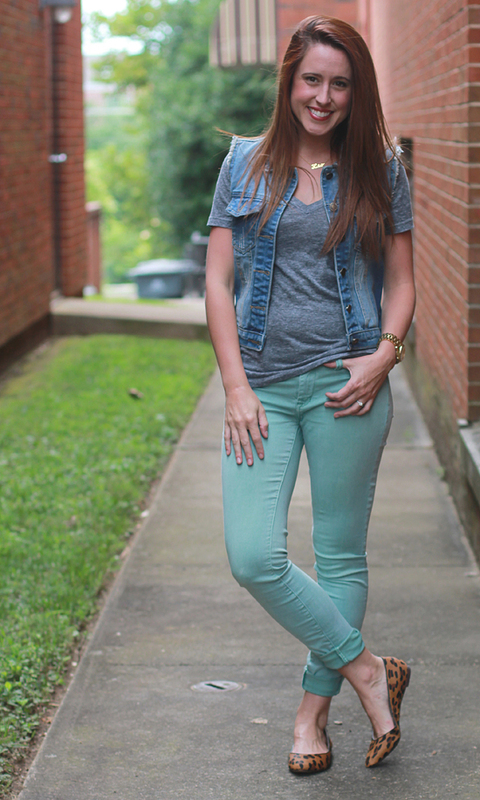 The denim vest is the perfect layering piece for jeans and a plain tee. Love this look! Jessica Who? sent me! Yay! I love seeing what people wear to work and school. 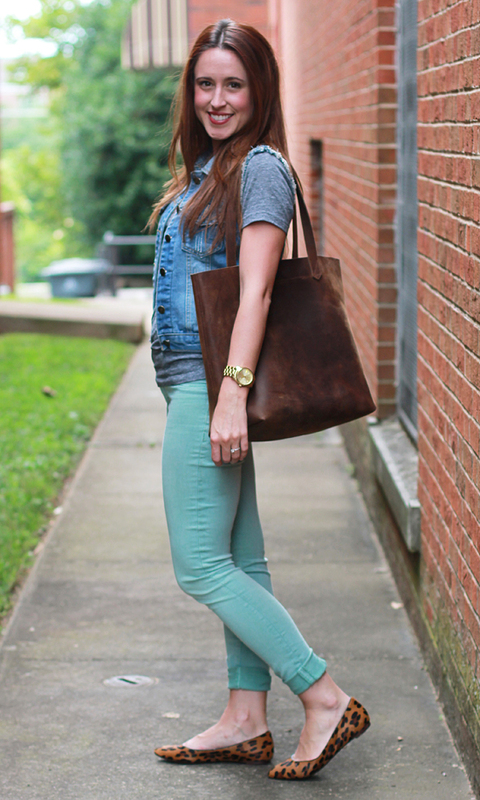 This is adorable - love your mint jeans! The leopard flats are a perfect addition to make it fun and exciting. I am excited to see more of your "grad school chic" outfits!! Hi Jess, happy Monday! I love the idea of a grad school chic series! Let's face it, many of us bloggers are forced (ha) to wear practical outfits, whether for school, work, or day-to-day life! Going over this outfit, I think I have nearly every piece...and may be copying this very soon. I recently inherited a denim vest and although I adore it, have been struggling to wear it, problem solved, thank you! Love your cute casual look! Jessica Who sent me, but I have followed you on GFC for awhile. Cute!! This looks perfect for school-- casual but adorably chic :) Love those pants too! Love your mint jeans! 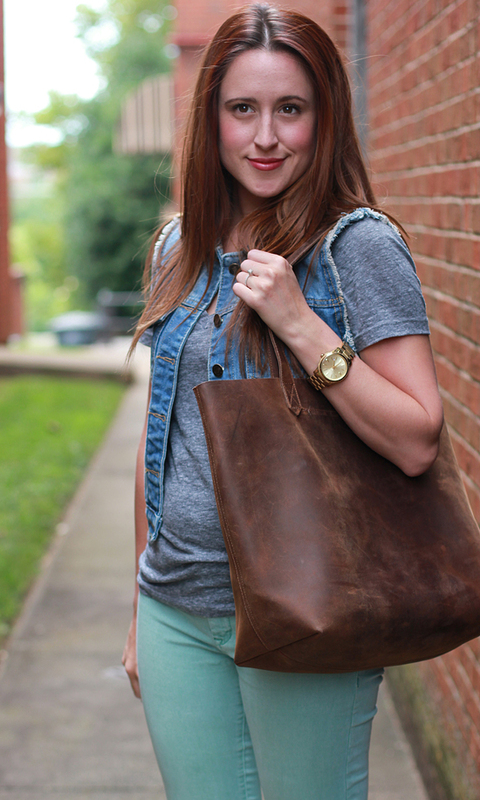 That tote looks perfect for carting around books and a laptop, exactly what you need as a grad student! Love love! I never understood why the college default is running shorts and a tee. I mean this looks just as comfy and 40655X as stylish!!! you are seriously convincing me i need a denim vest! I know you were eying these skimmers for a while, but I definitely agree that they were worth it! You look adorable (as always) and I can't wait to see some other casual grad school outfits to use as inspiration this fall! Woohoo for a grad school chic series! My program actually required business casual which I was so annoyed about at first, but it actually really helped me expand my style. I used to only own jeans, but the business casual forced me to try out ponte knit, corduroy, dresses, skirts, etc. I always used jewelry and shoes to make the outfits more fun, too! PS: Jessica Who? sent me! Reaaaaally behind on my blog reading. Sorry I'm a bit late to see this post but I just love this! I'm definitely a jeans and tee kind of girl and am trying to find ways to make the look a little more polished. The denim vest and flats brings such a similar outfit up a notch with a structured layering piece and nicer shoes than my go-to favorites: sandals. Very cute!